After all the hard and tedious work of painting and lining comes the most joyous part of any build: adding the detail parts that were left to remain in their metal colours. It is like after you've given the lady a dress you're now adorning her with jewels. The holes that take up the various detail parts must be cleaned out from paint and coating with a suitable drill. If you simply press the parts in there is a substantial risk that the paint will chip. Before anything else the detail parts are trial fitted. It is better to check and find nothing at fault then to smear the lot with glue and then find something is wrong. The walls of the holes are carefully provided with layer of 2-component expoxy glue. I apply the glue with a pin and round round the inside. Very little does the job. I also added a tiny bit of glue on the stems of the parts. Then they carefully put them into place. I tried to avoid excess glue and if there was to much I wiped it off immediately with a moist cotton ear swab. Be careful to leave no traces. The driver's side has the extra of the handrail in two parts and of the snifter valve just behind the sandbox. To keep the snifter valve clear of the boiler, I stuck two layers of Post-It behind it. When the glue had set I removed that and had a nice spacing of just a few tenths of a millimetre. The end of the brass wire protruding into the cab was cut short with a flush cutter. Spot the nine differences with the previous photo. Got them? Scroll down to see if you were right! the last one is again difficult to see on the photo. The "shunting" post on the far edge of the footplate in the front was painted metal. After this the loco was sprayed with another gloss clear coat to strengthen the existing layer on the painted parts and to give the metal parts a layer that will protect them from discolouration. This is how the drive is assembled. Two strips of styrene will help to keep the drive snug against the bottom of the footplate. The couplers are of the three link type. Mounting them proved to be less straight forward then I had hoped for. The couplers have a long stem onto which a spring is mounted. This pre-loads the coupler and allows it to move outward when the buffer of the loco touches the buffer of the first car in a curve. Unfortunately I found that on both sides of the loco this stem interfered with the screw that connects the drive to the footplate. No room to go with the spring. I should have addressed this issue at the latest before starting the painting of the loco. Now it was too late. After some thoughts I cut the stems short and attached them with a drop CA. The loco will spend its life in the display cabinet anyway, so why bother. 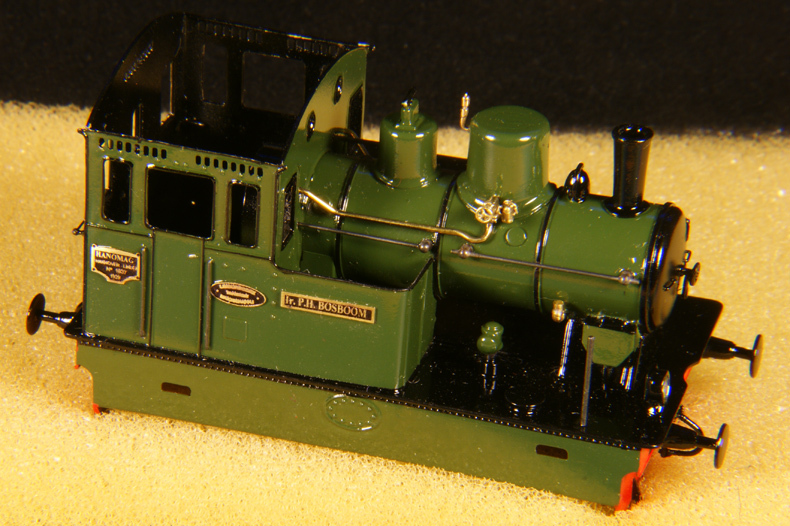 For someone wishing the build this loco as motive power on a layout: address this in the early stages of construction. I used a tooth pick. I stuck it in the gooey substance, picked up a drop, touched a window post from the inside and worked my way around the edges of the window. I did all windows on one side. After that I left it to dry at least one hour before working another side. It will take up to days to turn completely clear but have faith, it will in the end. Some other hints and tips. Try to get a nice and even coverage of the all window posts and corners. Getting the amount right is a matter of experience but in your first attempts you will find you have been too sparing. Work quickly as the stuff develops a skin after just a minute or so. Try to avoid the inclusion of air bubbles. They will not go away. I you have overlooked one, let the window dry completely and remove it. Then reapply Kristal Klear in the cleaned out window opening.